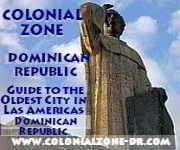 Our other Pages about Food and places to dine in and around Colonial Zone. Mimosa - When you see a restaurant that is filled with the locals you have to try it out yourself. Nothing fancy but they serve great typical Dominican fare including the daily plato del día/ plate of the day (what is the plate of the day you may ask, La Bandera of course) They also have fresh baked goods available and are open early for the breakfast crowd but not for dinner. Their goat anything (stew, guisada, braised) is worth a try. Enjoy the breeze of the Caribbean Sea for breakfast, lunch dinner and whatever comes in between. Watch the sea while dining on fresh seafood, such as langostas, prawns and shrimp grilled or broiled. They also serve many typical Dominican dishes including the traditional mofongo and sancocho. Take a stroll down the Malecon in the Zona Colonial and stop by for a drink or food or both. A formal restaurant specializing in Italian food. The Spaghetti Franco is highly recommended. The Denny´s franchise restaurant, the largest full service restaurant chain in USA, came to DR in 2012. The most recent location to open is right here in the Colonial Zone on Calle el Conde. They are offering all the favorites they are known for including the Grand Slam Breakfast. One notable different is this location has a full bar. They have both outside seating on the Conde so you can people watch or inside where it is air conditioned. Hours: 7AM daily until 11PM and open 24 hours on Thursday, Friday and Saturday. The atmosphere is very casual and inviting. Dine and/ or drink sitting at the bar, a table or a quiet sofa in the corner. A great place for couples. They also serve some great French type wines, foods and snacks. Later in the evenings there is an in-house DJ for those nights of dancing and partying. This is a good place to go any hour. The Dumbo Sandwich and their Mondongo is excellent (almost as good as homemade). They also have gook breakfast and a daily special. This small place serves fresh Spanish style dishes with 5 tables and a small bar. The owners are very friendly and do all the cooking and serving. There is always some Spanish music playing softly in the background. They serve the typical dishes at a very reasonable price including Paella, Conejo al Vino, Lambi Guisado and more. The restaurant offers many different dishes and a daily special that is usually always good. A full service restaurant serving breakfast (they have a very good breakfast buffet), lunch and dinner. There is a small terrace where you can sit and people watch along Calle el Conde, a pedestrian only street that runs the entire length of the Colonial City. Sometimes on the weekend they have a disc jockey playing dance music. The best authentic falafel, hummus and shwarma around! The picante sauce is good and hot and their tahini sauce is very tasty, both of which can be purchased in large amounts to take home. The restaurant is so relaxing and comfortable with their large open-air patio where one can dine and drink. The Sala Goico is a place where they have many cultural activities including plays, belly dancing and music. They also have a gift shop called Maia inside the restaurant with many unique one of a kind items. This is a family run business that has been around a long time. They make tacos, burgers and sandwiches. Serving up some great breakfast including omelets and some tasty mangu. You can get all sorts of beverages including fresh juices. Learn English, French, Spanish, Japanese, and more on line when you have time. Be part of a global language learning community.